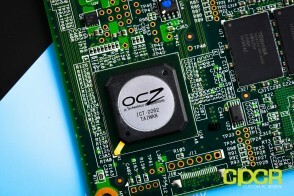 Over the past year or so, it’s been no secret that OCZ has had a bit of a rough time in the market, but with the sale of their company to Toshiba late last year, OCZ has quickly been turning themselves around with several new product introductions to complete their transition from the old OCZ Technology Group to the new OCZ Storage Solutions, a Toshiba Group Company. 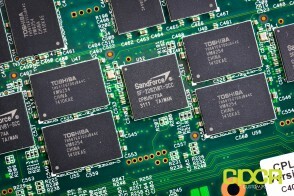 As a part of their transition, OCZ has been revamping their entire product stack to utilize parent company Toshiba’s NAND. 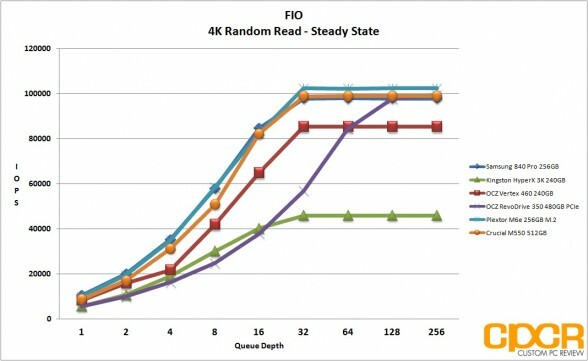 By doing so, this will not only allow OCZ to put top quality NAND in their SSDs, but also provides OCZ with better cost efficiency. 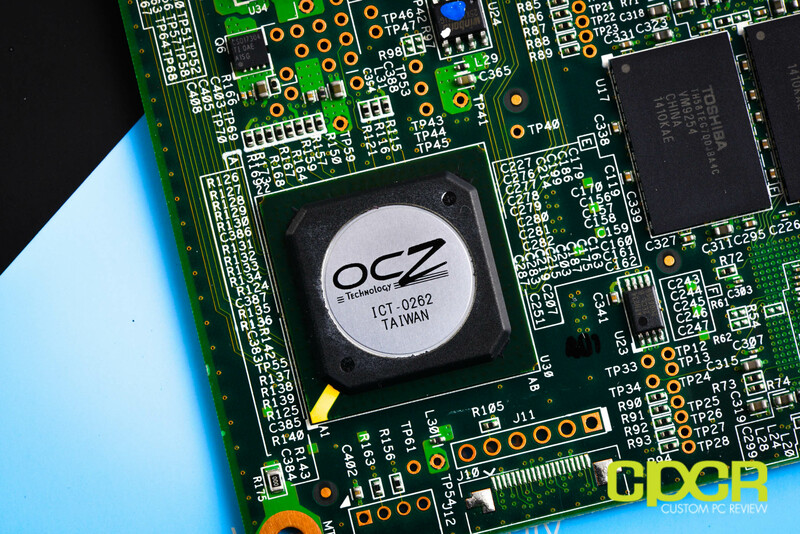 Back in late 2013, OCZ began their transition to Toshiba NAND with the introduction of the Vector 150. This was then followed by the move to Toshiba NAND with the OCZ Vertex 460, which was released back in January making both OCZ flagship SATA drives based on Toshiba flash. 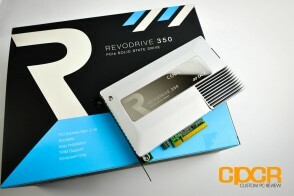 This then leaves the RevoDrive series which not only needed to be converted to the new flash, but also needed an update as well, given the fact that the last generation RevoDrive was introduced sometime in 2011. 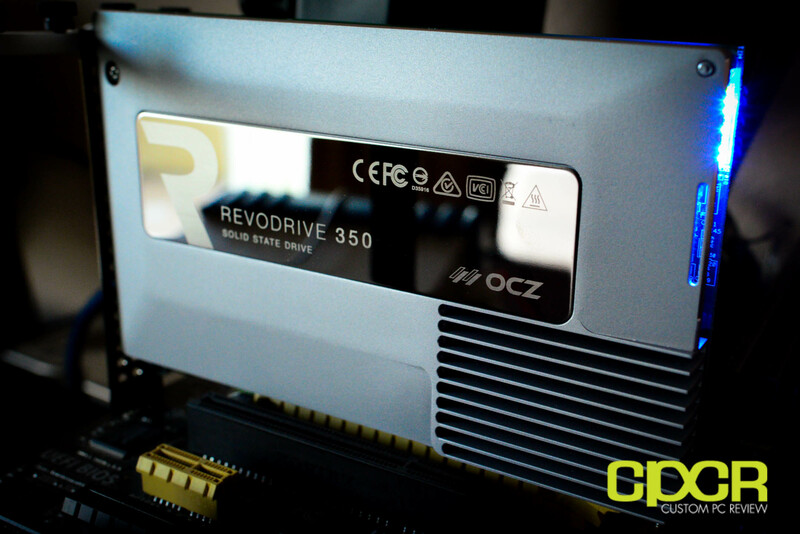 As such, OCZ recently unveiled their latest introduction into the PCIe SSD market, the OCZ RevoDrive 350, which we’ll be reviewing today. 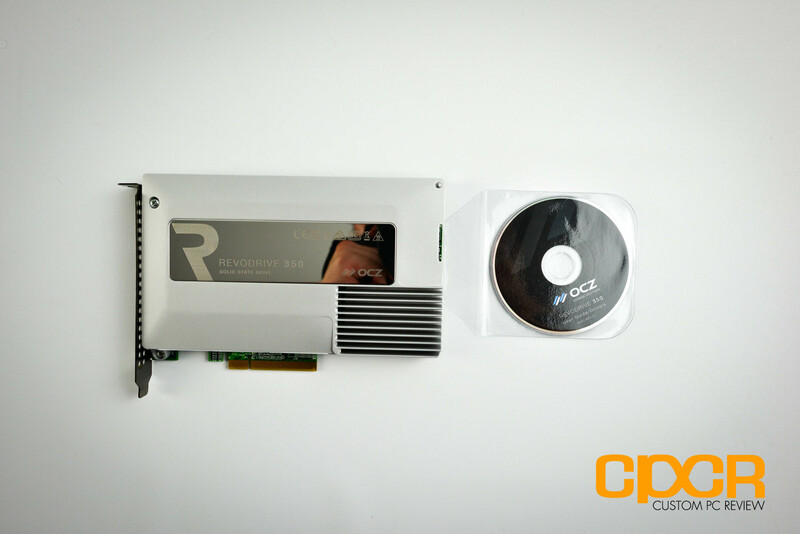 The OCZ RevoDrive 350 is a full height, half length PCIe SSD which will be available in capacities of 240GB, 480GB and 960GB. The drive will be powered by either 2x LSI SandForce SF-2282 controllers for the 240GB model, or 4x LSI SandForce SF-2282 controllers for the 480GB and 960GB models for maximum performance of up to 1,800MB/s reads and 1,700MB/s writes. Since the controllers aren’t designed to interface with each other natively, they’re aggregated using OCZ’s onboard ICT-2062 SuperScale storage controller (SCSI RAID controller) along with OCZ’s VCA (Virtualized Controller Architecture) 2.0, which we’ll discuss in a bit. The new RevoDrive 350 also includes an upgraded PCIe Gen 2 x8 interface from the older PCIe Gen 2 x4 interface on the previous generation RevoDrives. Like last generation RevoDrives, the RevoDrive 350 will be bootable via PCIe and new for this generation is Linux support, which should be a huge win for those planning to use the RevoDrive 350 in some sort of server configuration. 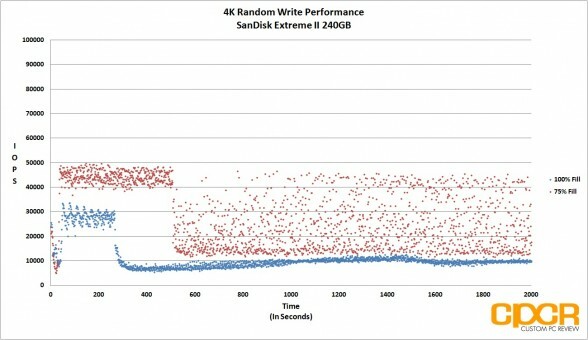 If that sounds pretty exciting, let’s take a closer look at the drive! Here’s a look at the packaging for the OCZ RevoDrive 350 480GB PCIe SSD. 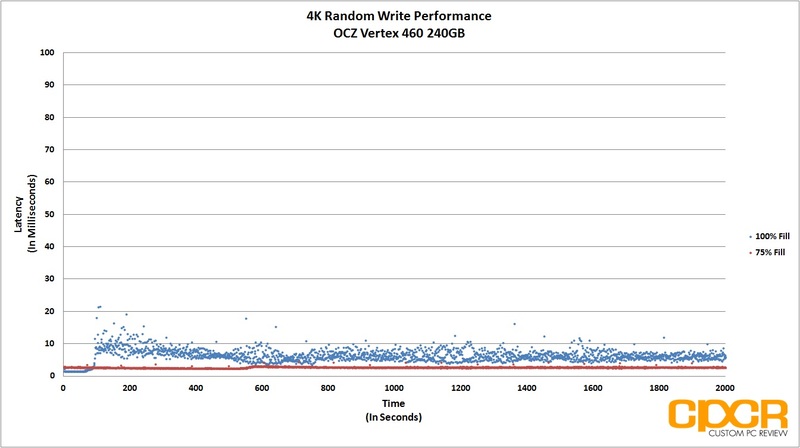 Included, we get a driver/utility disk and the shiny new OCZ RevoDrive 350 480GB. Those planning on booting from the RevoDrive 350 will need to use the drivers on the disk for the Windows installation process to detect the drive. Here’s a closer look at the OCZ RevoDrive 350. 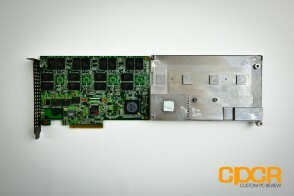 The drive comes in a half length, full height PCIe form factor with a PCIe Gen 2 x8 connector. 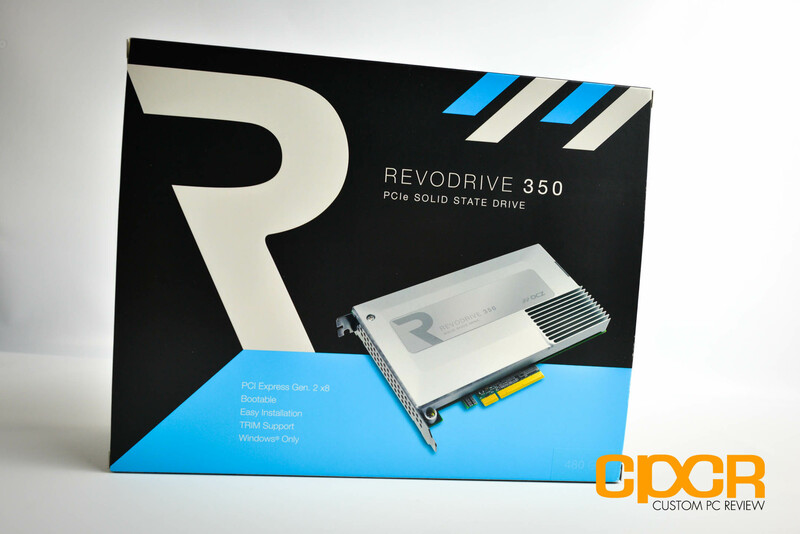 Unlike older RevoDrives, the entire length of the RevoDrive 350 is covered with a large metal casing which not only makes the drive look pretty cool, but also acts as a heatsink for the onboard OCZ ICT-0183 SuperScale processor which powers VCA 2.0. Despite our sample being only the 480GB model, we can see that the entire PCB is filled to the brim – front and back. This is actually a slightly more efficient design than the older RevoDrive 3 X2 which needed a separate riser PCB for larger capacity drives. 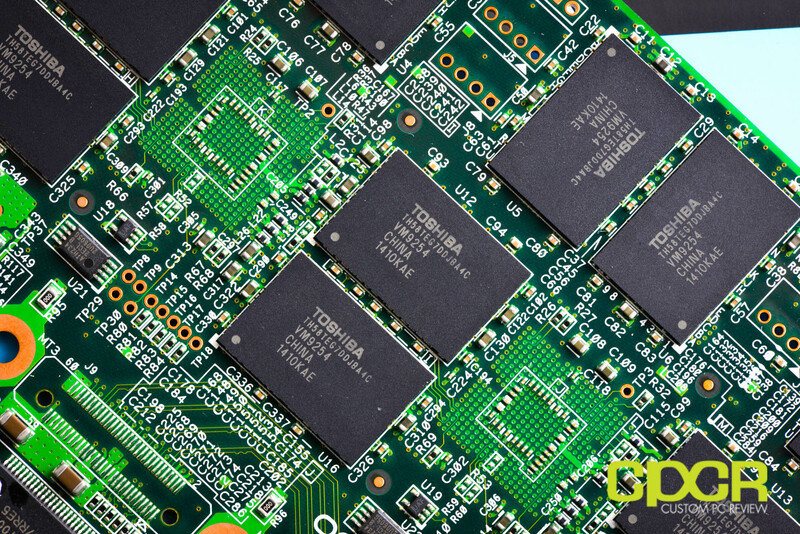 Right off the bat, we can also see that the PCB is split into four separate partitions with each partition containing its own controller and eight packages of NAND. Interestingly, rather than introducing a new RevoDrive built fully in-house, the OCZ RevoDrive 350 480GB is powered by a combination of 4x LSI SandForce SF-2282 controllers along with an in-house ICT-0262 SuperScale storage processor. 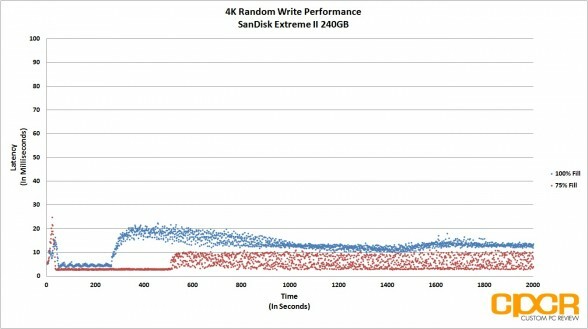 While OCZ has been transitioning most of their SATA SSDs to in-house Indilinx controllers, the choice to go SandForce with the RevoDrive was most likely due cost and time to market, allowing OCZ to revamp the product stack to quickly take advantage of Toshiba NAND. 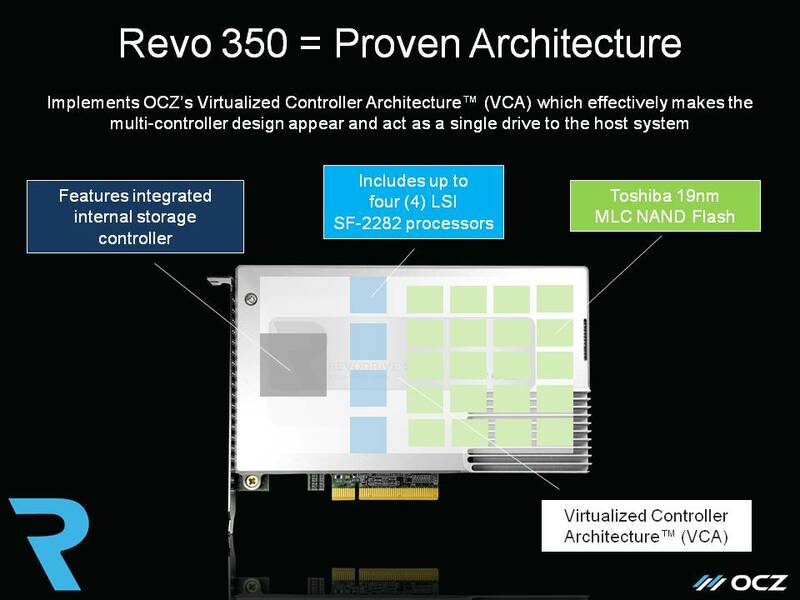 Sitting between the RevoDrive 350 and the host system is OCZ’s VCA (Virtualized Controller Architecture) 2.0 virtualization layer. 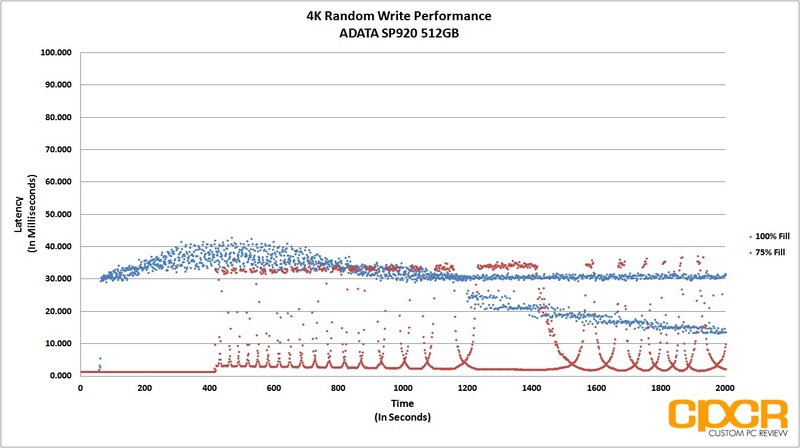 As its name suggests, VCA 2.0 acts as a RAID controller and aggregates the performance of the four separate drives on the RevoDrive 350 into what appears to be a single drive for the host. What’s interesting about VCA is that it doesn’t stripe data like a typical RAID-0 array. 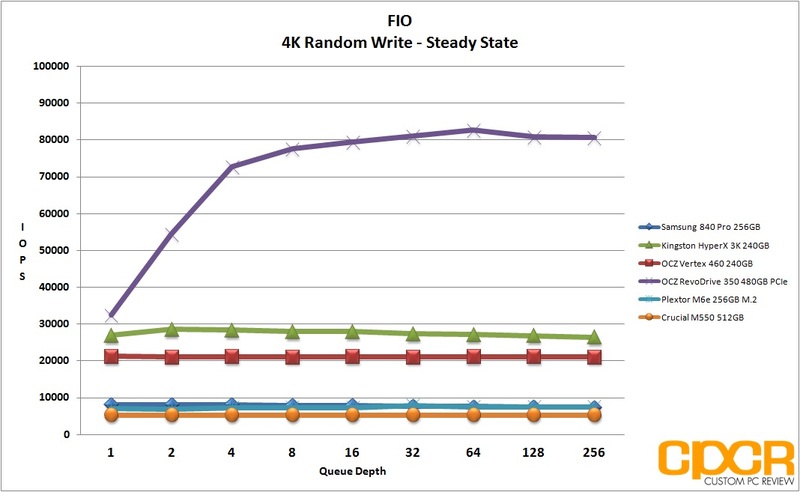 Instead, VCA acts more like a JBOD array in that it dispatches requests to each individual controller in parallel. 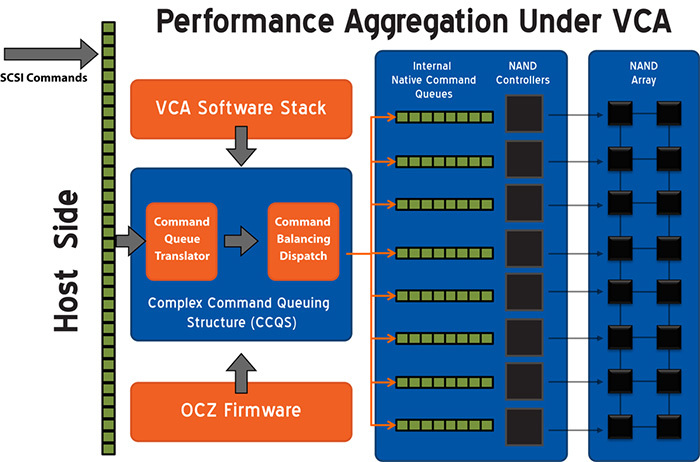 VCA then takes care of load balancing to ensure even wear leveling, redundancy, and passing commands such as secure erase, TRIM, S.M.A.R.T. health monitoring, etc. to each drive. 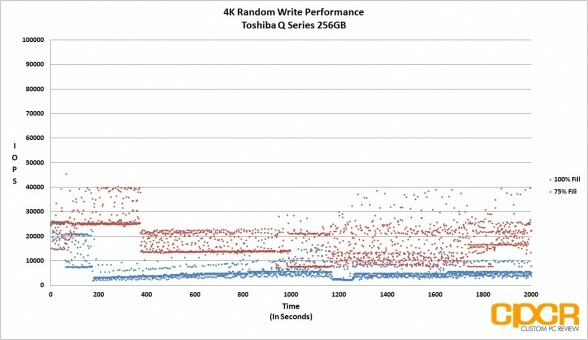 As expected, the OCZ RevoDrive 350 is now powered by Toshiba’s 2nd Generation 19nm Toggle Mode MLC NAND. Our 480GB model included a staggering 32 NAND packages for a total of 512GiB. 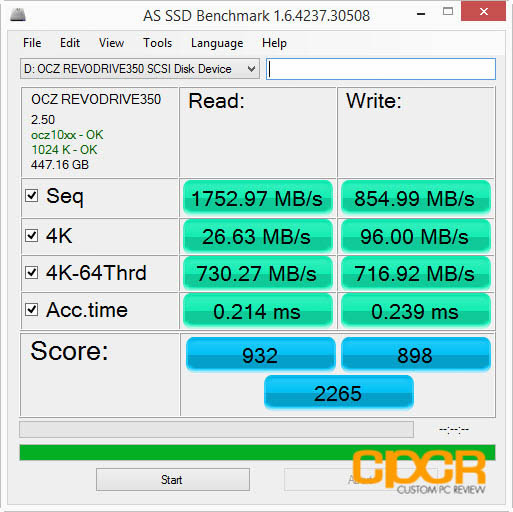 Today we’ll be reviewing the OCZ RevoDrive 350 480GB PCIe SSD with firmware version 2.50. Thanks to VCA 2.0, the four “drives” onboard are aggregated into a single drive, and we can see that it supports S.M.A.R.T., APM (Advanced Power Management), NCQ (Native Command Queueing), and TRIM. 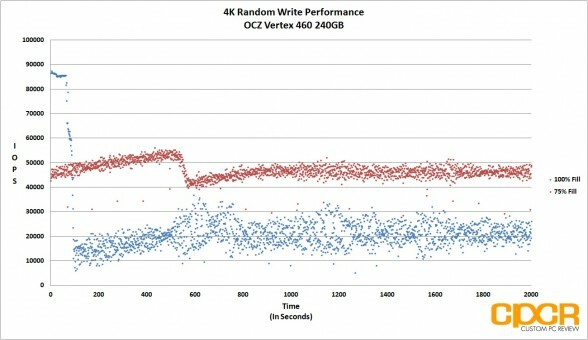 Here’s a quick first look at the performance of the OCZ RevoDrive 350 480GB. 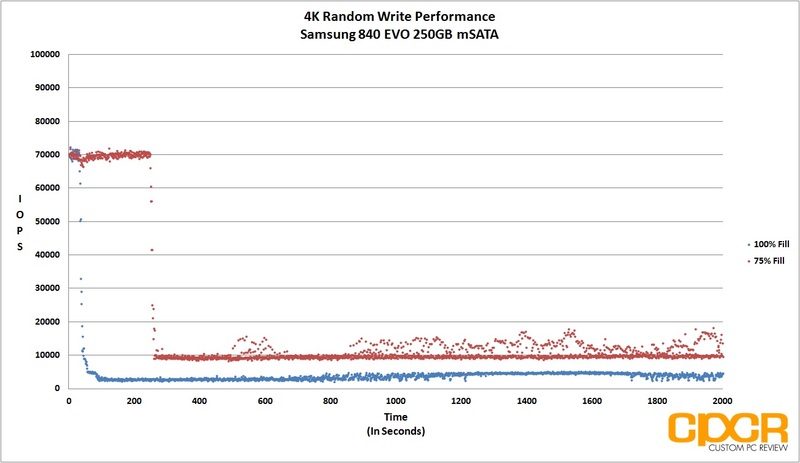 At 2GB/s sequential reads and 1.9GB/s sequential writes, I think it’s safe to say that the RevoDrive 350 is probably the fastest SSD we’ve tested to date. At QD1, the RevoDrive 350’s performance is once again quite good. Sequential reads topped the charts at 1,753MB/s and sequential writes were able to reach a respectable 855MB/s. 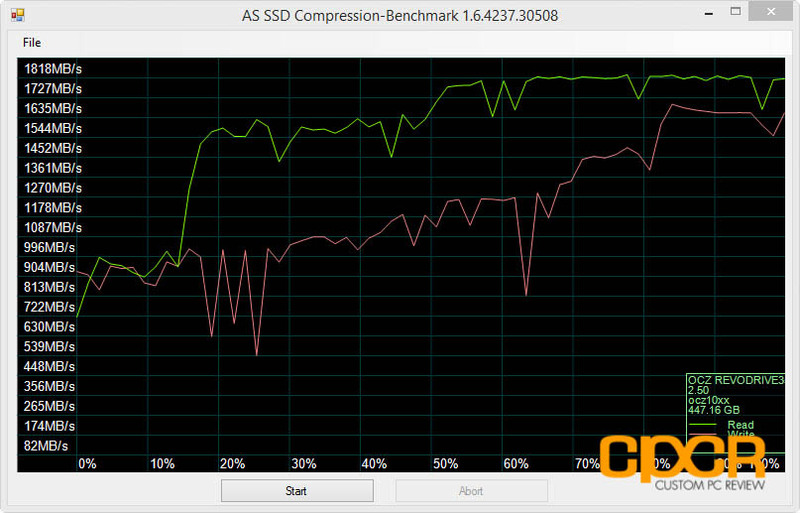 Since we’re dealing with a SandForce based drive, we can see in the AS SSD compression benchmark that performance improves dramatically as data becomes increasingly compressible. 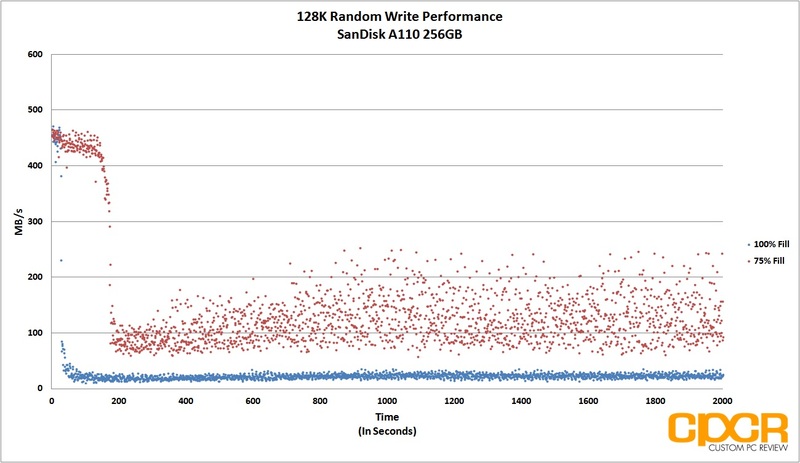 Crystal Disk Mark performance was once again quite solid with read performance of 1479MB/s and write performance of 1325MB/s with fully compressible data. 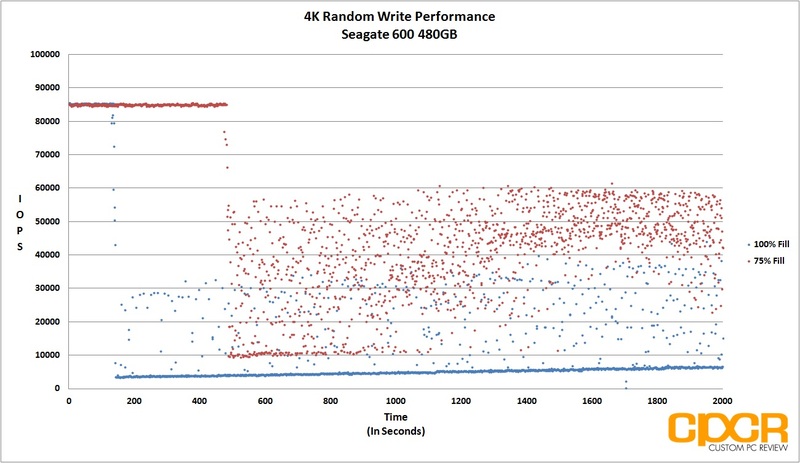 Moving to incompressible data, performance was slightly lower coming in at 1397MB/s sequential reads and 698MB/s sequential writes. 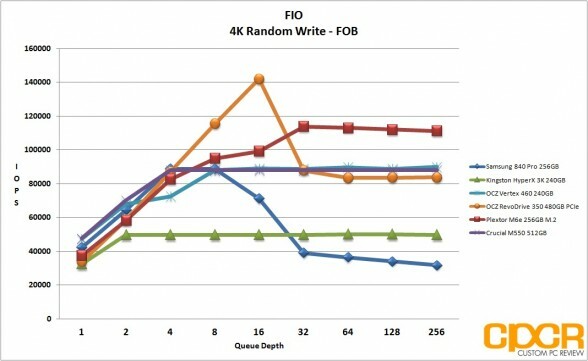 512K and 4K QD32 performance figures were quite good as well suggesting that the RevoDrive 350 performs best with either large block or high queue depth operations. 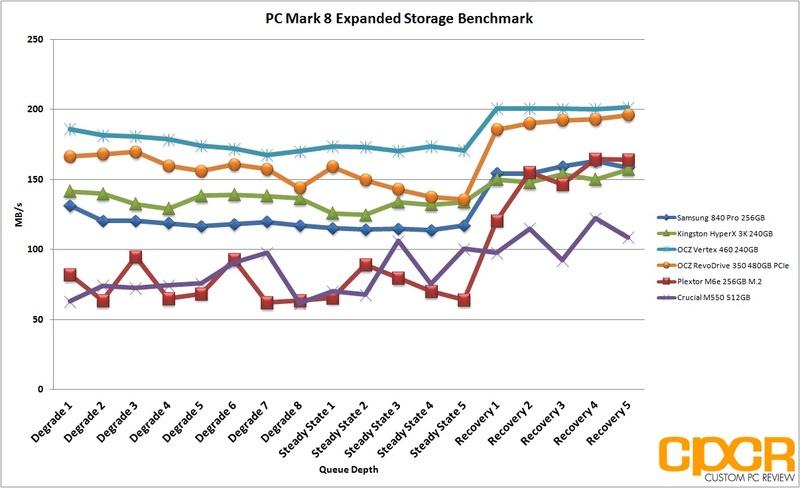 In PC Mark 7, the OCZ RevoDrive 350 performed quite well, shooting itself to the top of the pack as the fastest drive we’ve tested. Moving into the new PC Mark 8 Expanded Storage Benchmark, the OCZ RevoDrive 350 still did quite well against the drives tested although it was slightly beat by its SATA based cousin, the OCZ Vertex 460. This is due to the fact that the RevoDrive 350 is built for large block, high queue depth operations rather than typical consumer workloads that include mostly small block and low queue depth operations. Here’s where the RevoDrive 350 truly shines. 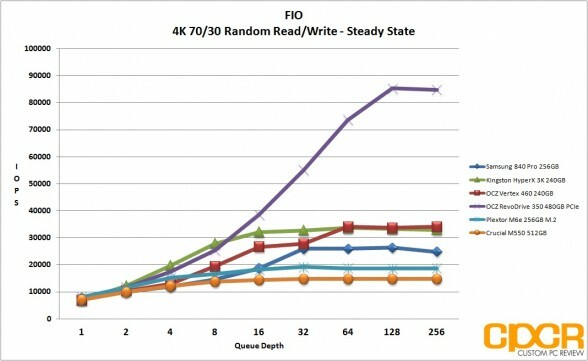 With FIO loading up the drive to its full potential, the OCZ RevoDrive 350 is exceedingly quick, scaling extremely well to high queue depth operations. 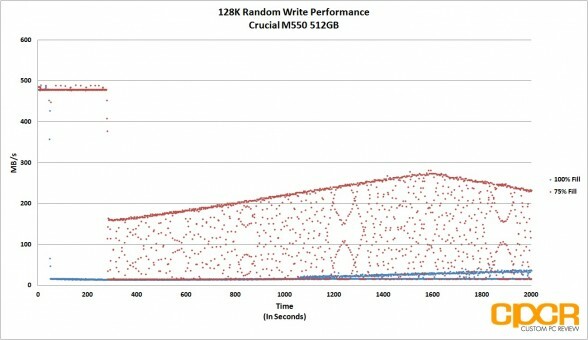 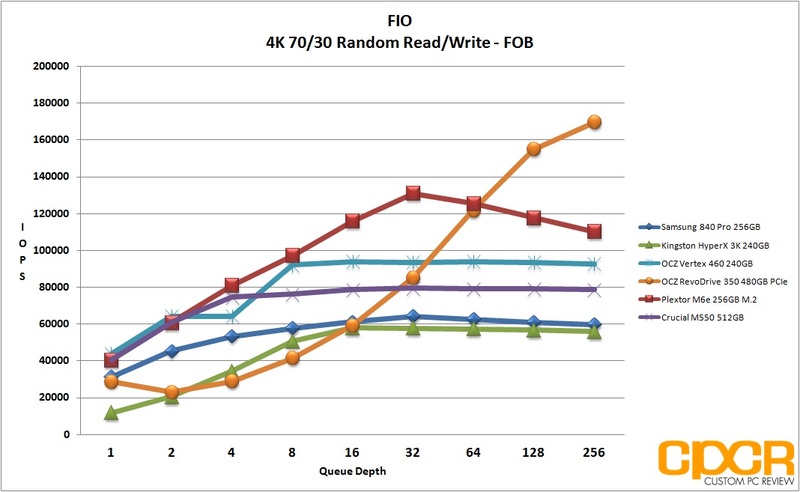 At queue depth 256, the RevoDrive 350 was able to pull an astonishing 294,794 IOPS – three times more than the fastest SATA based SSD on the market. 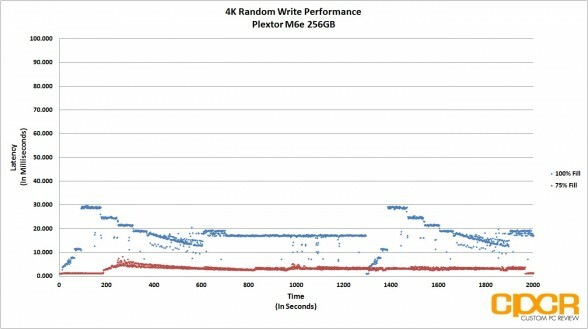 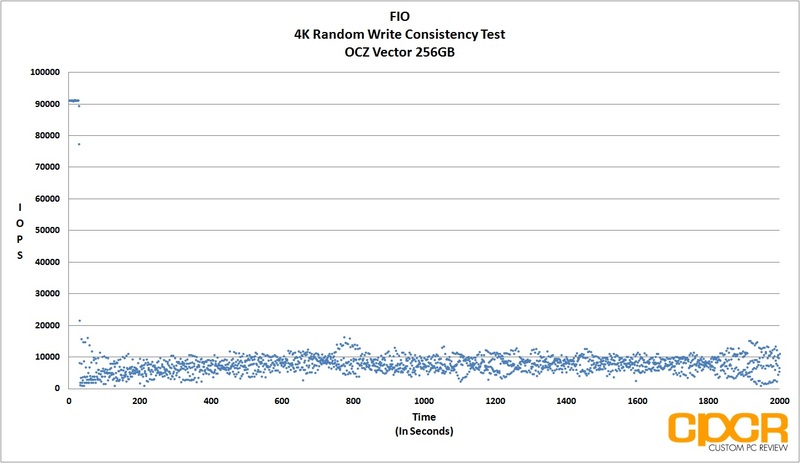 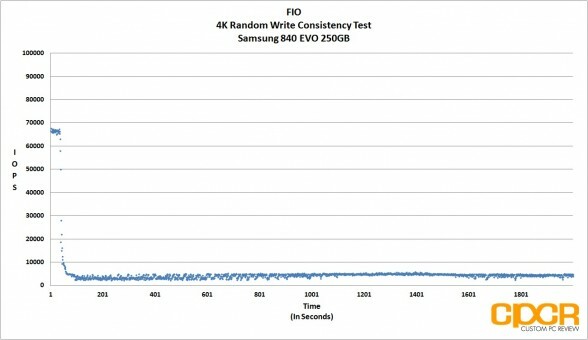 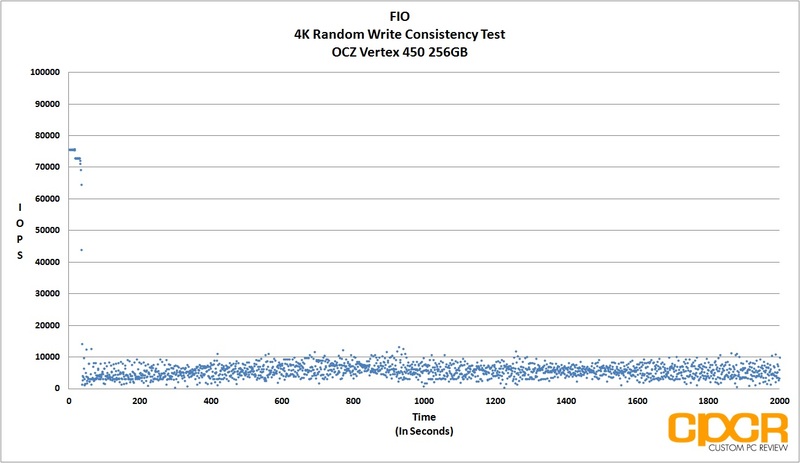 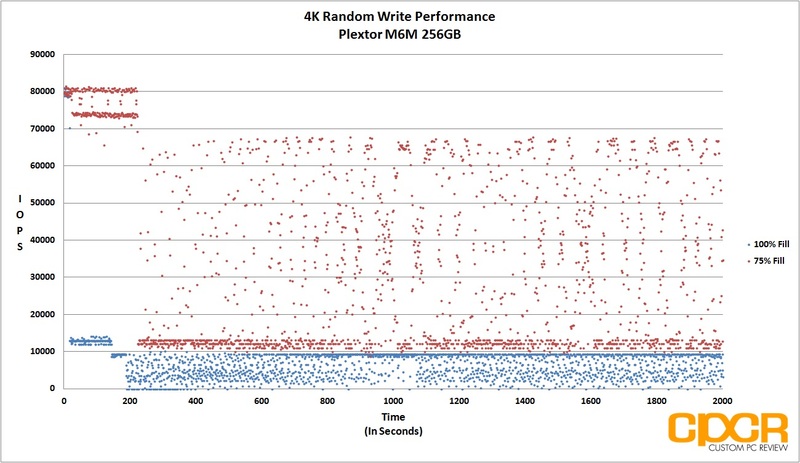 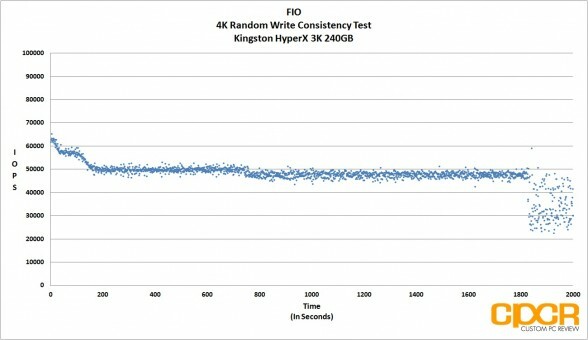 Similarly, 4K random writes were quick as well, with the drive pulling a maximum of 142,000 IOPS at QD16 before leveling off at 84,000 mark at QD64, QD128, and QD256. 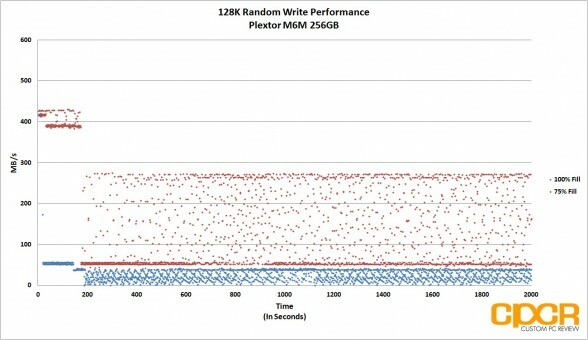 Mixed workload performance wasn’t slow either and after QD32, the drive was able to pull a maximum 170,000 IOPS at QD256. 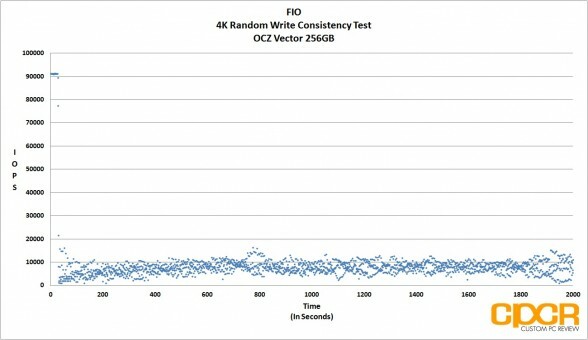 While fresh out of the box performance was good, steady state performance was probably more impressive. 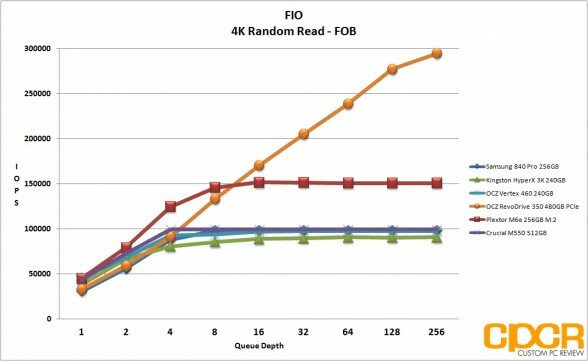 At higher queue depths, the OCZ RevoDrive 350 was only slightly short of 100,000 IOPS 4K random reads while while 4K random writes blew past the competition at just over 81,000 IOPS. 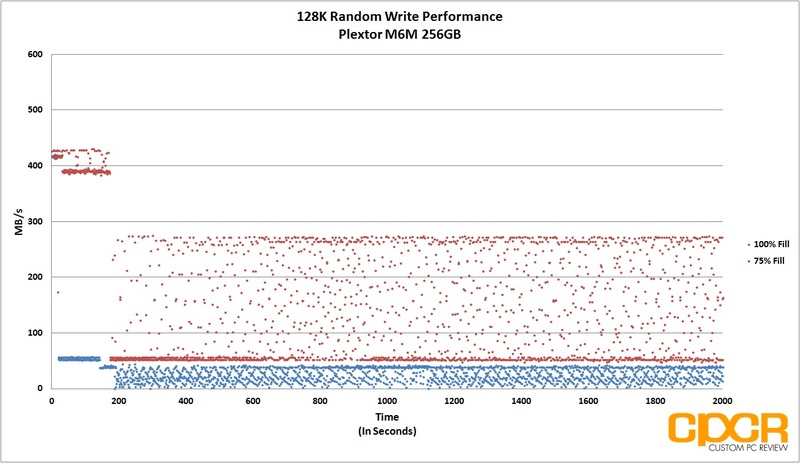 Mixed workload performance was extremely impressive as well once we reached higher queue depths with the drive pulling a maximum 85,000 IOPS at QD128. SandForce based drives have always been excellent performers when it comes to 4K write consistency and with the OCZ RevoDrive 350 480GB being based off four of them, I’d say write consistency is probably the best we’ve seen to date from a client oriented drive. 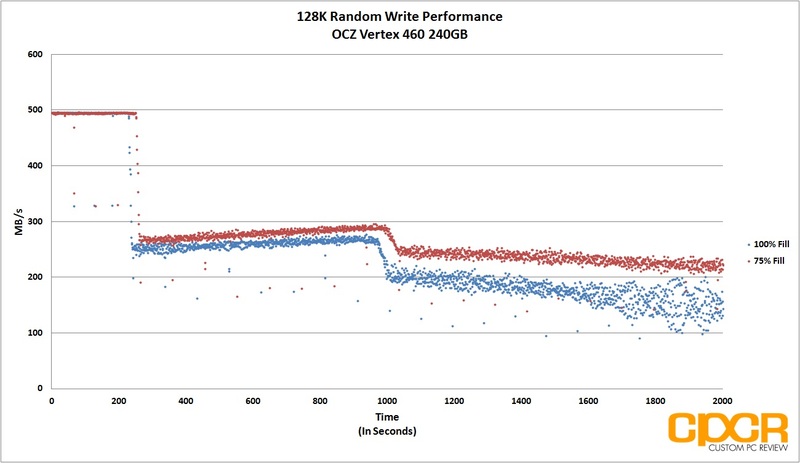 Once the RevoDrive 350 entered steady state, it proved to be extremely consistent, keeping performance between 82,000 and 85,000 IOPS throughout our entire 2,000 second test. 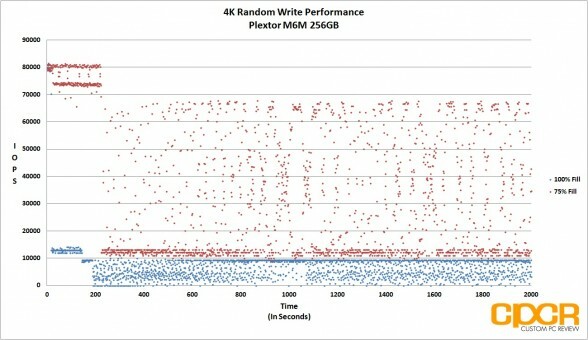 What was more surprising was the fact that the drive was able to maintain near identical performance at both 75% and 100% fill. 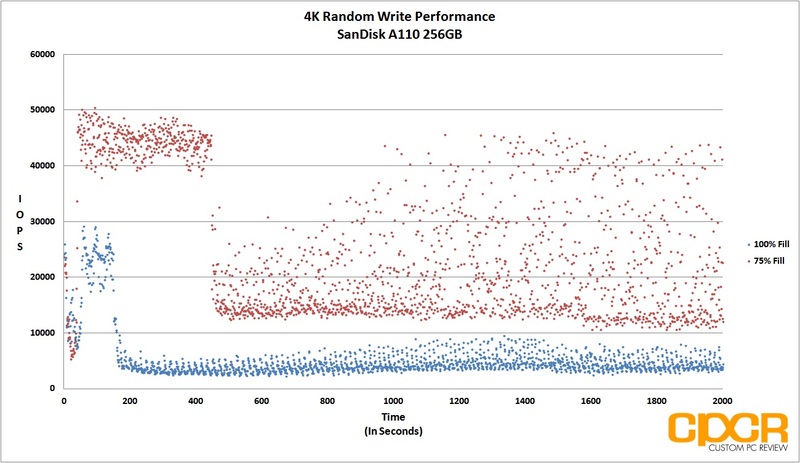 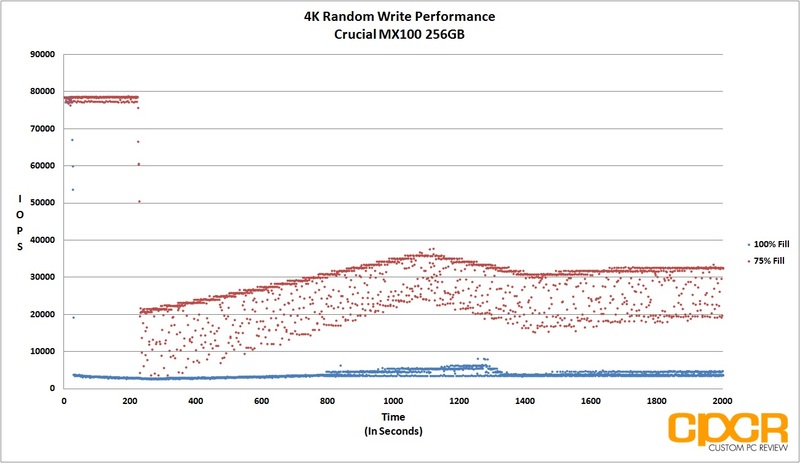 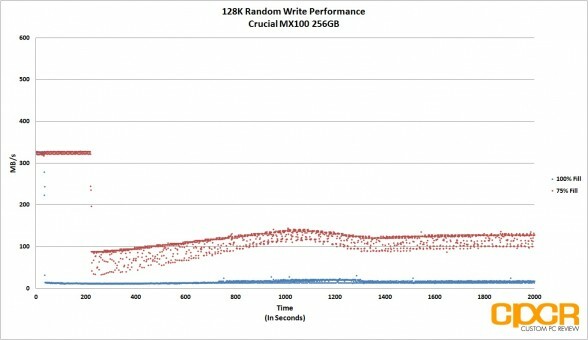 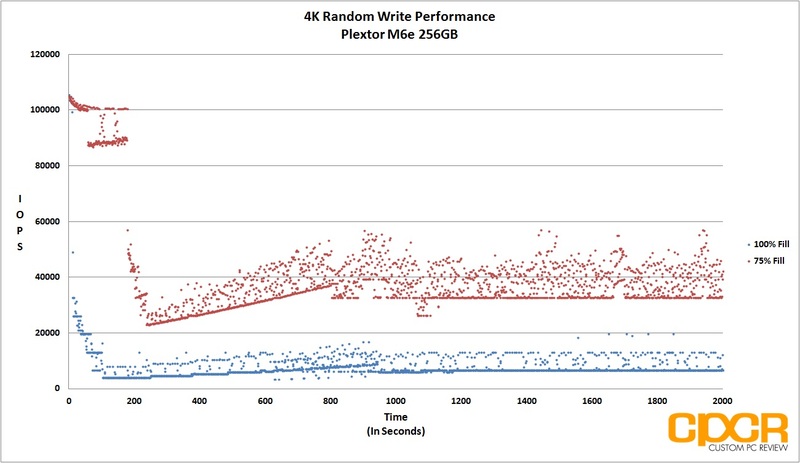 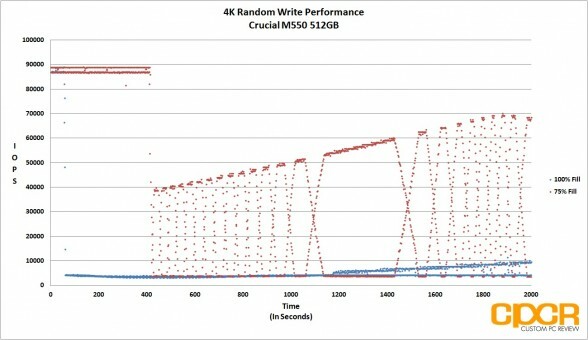 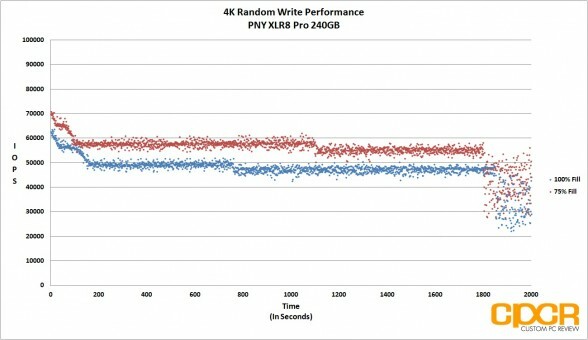 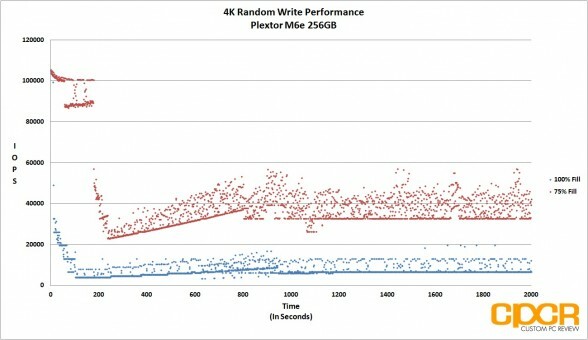 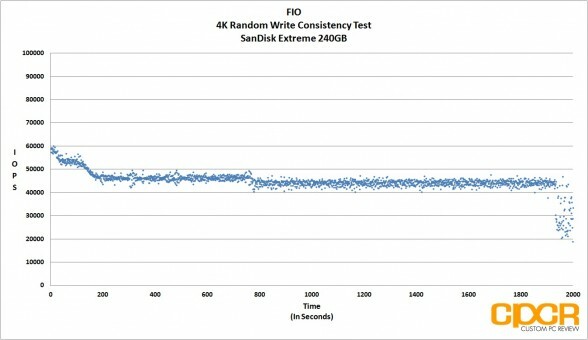 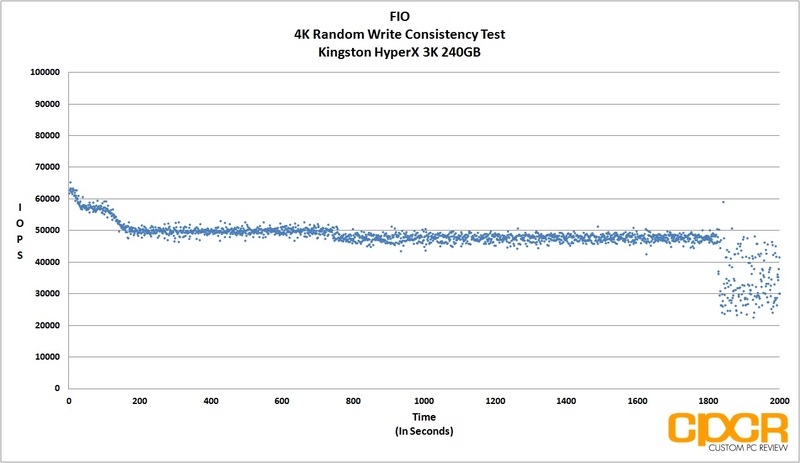 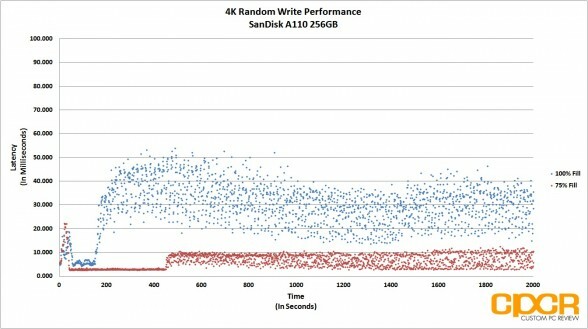 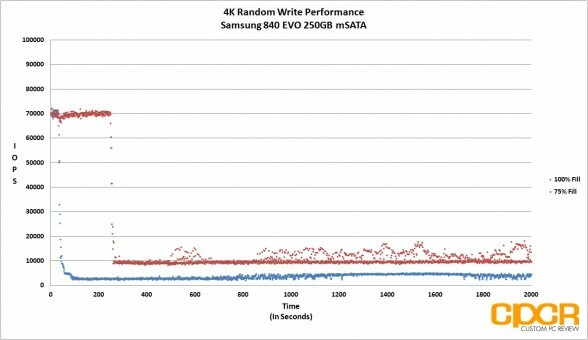 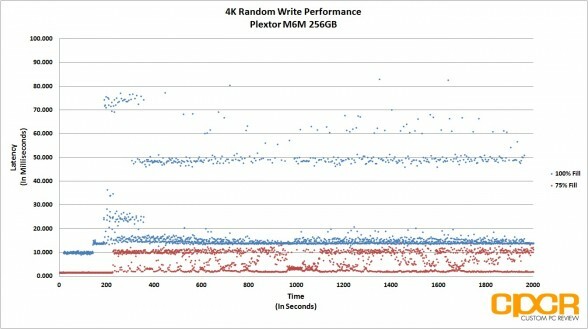 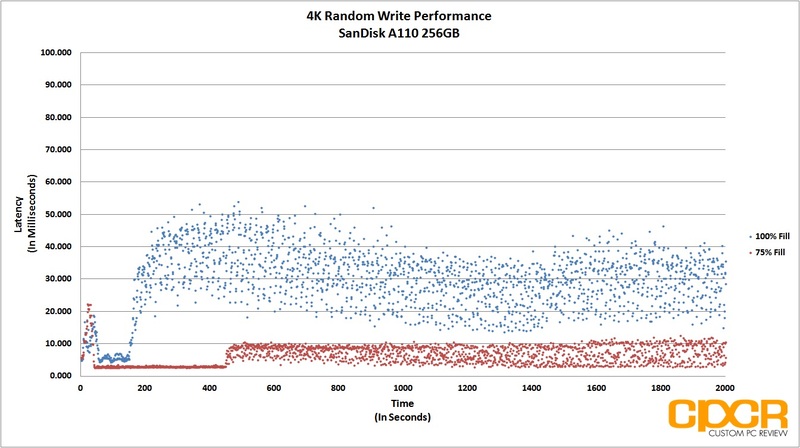 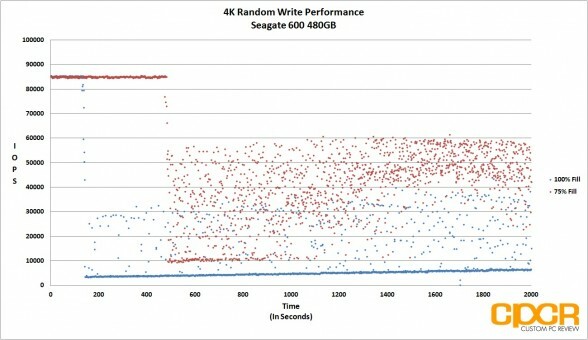 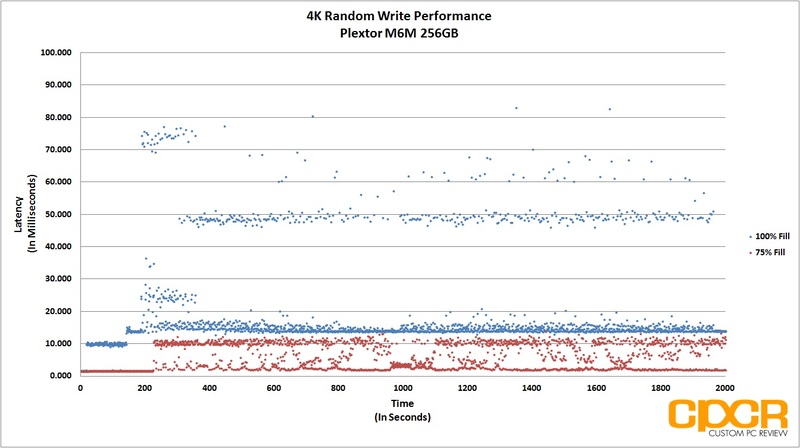 While 4K write IOPS consistency was impressive, 4K write latency was probably more impressive. 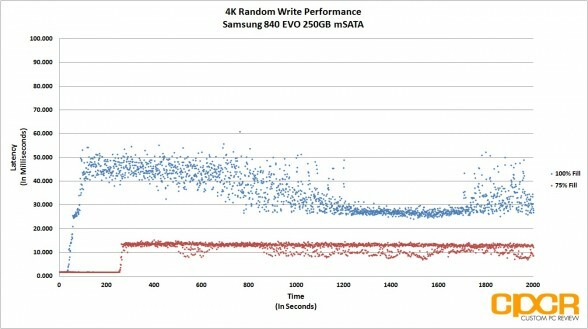 In our entire 2,000 second test, the RevoDrive 350 managed to keep latency not only consistent, but also at sub-0.5ms, which is the best we’ve seen from any SSD, including enterprise SATA SSDs. 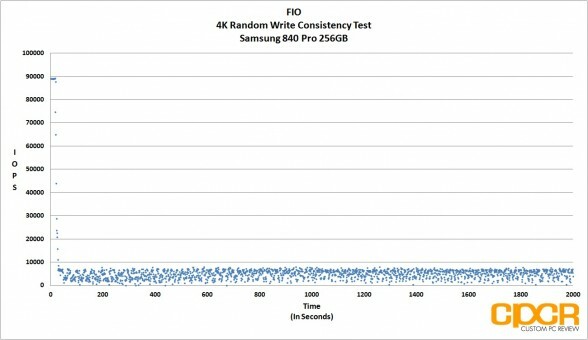 Although 4K random writes were the fastest, most consistent I’ve seen to date, 128K random writes were a slightly different story. 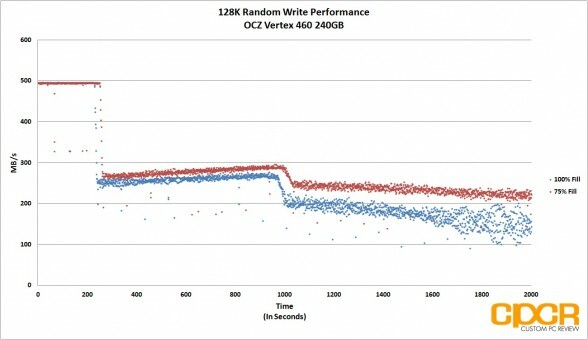 While OCZ got the performance part of it down, the drive was fairly inconsistent when it came to larger block transfers. 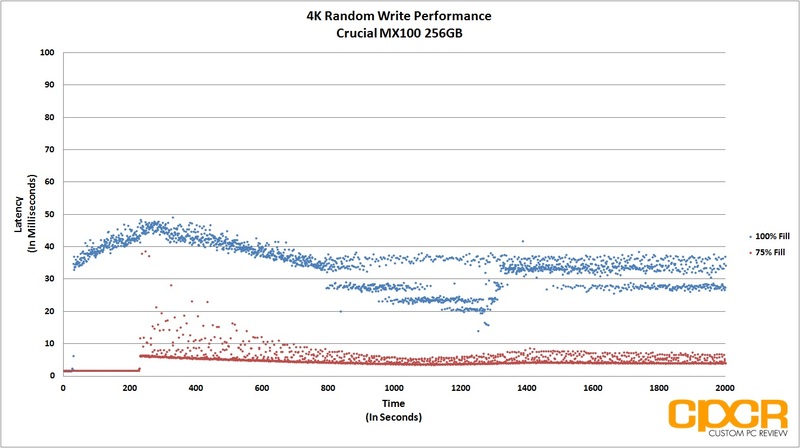 Steady state performance at 100% fill ranged from 600MB/s way up to 1,200MB/s while steady state performance at 75% fill ranged from 700MB/s up to 1,300MB/s. 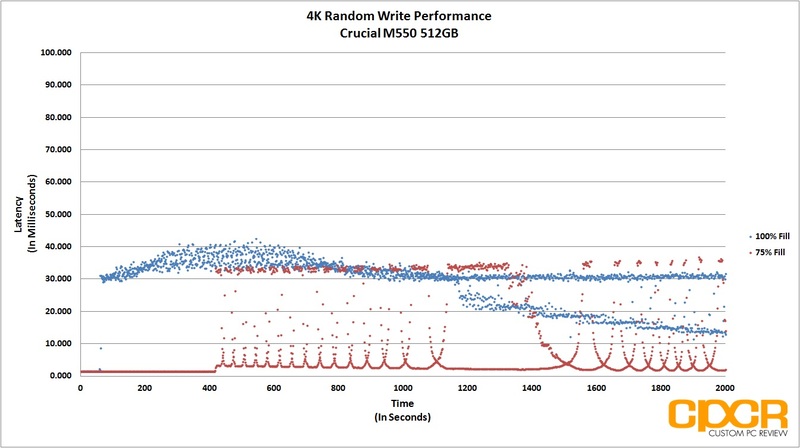 While inconsistent, you do have to give the RevoDrive 350 a ton of credit for being able to do even 600MB/s in steady state. 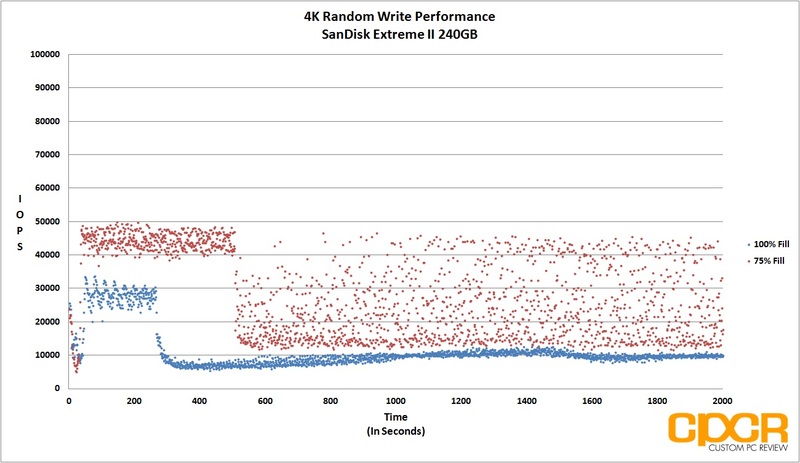 This is a phenomenal feat given that no SATA based drive tested today was capable of exceeding even 300MB/s in steady state. 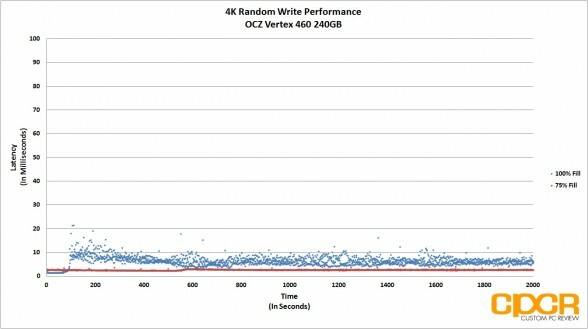 Looking at OCZ’s lineup today, it’s become quite apparent that OCZ is looking to position themselves as a manufacturer of high end enthusiast and enterprise SSDs, and with their Vertex, Vector and RevoDrive lines in place in the client side, OCZ has a fairly strong lineup to compete in the segment going forward as well. 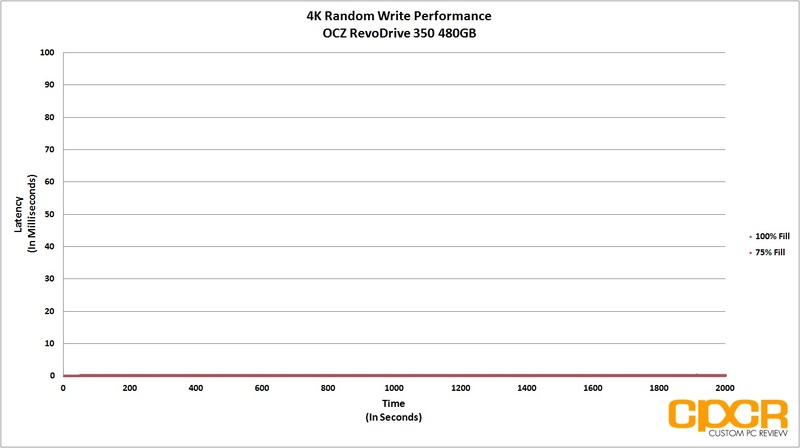 With that said, let’s talk about the RevoDrive 350. 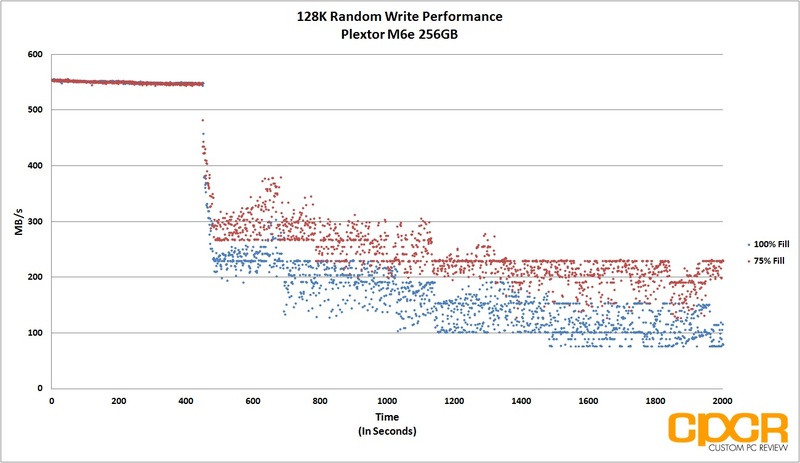 Starting with performance, performance on the RevoDrive 350 is extremely, extremely good. 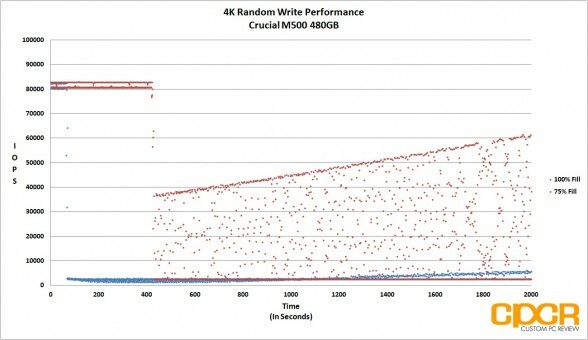 Let’s get that out of the way. 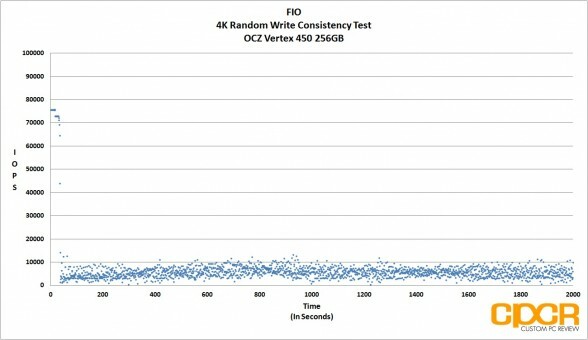 However, as you’ve probably noticed from our testing, it’s only extremely, extremely good when faced with an appropriate workload. 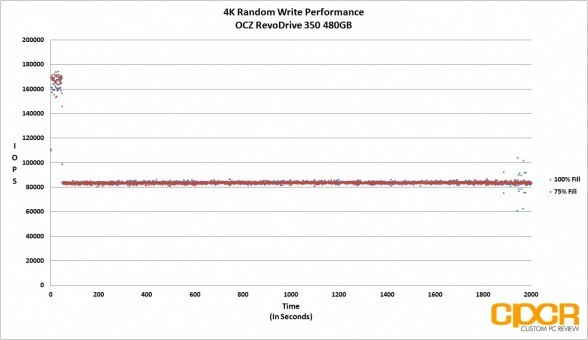 For a typical consumer looking to surf the web, play some games, or work on some excel spreadsheets, the OCZ RevoDrive 350 is way overkill. 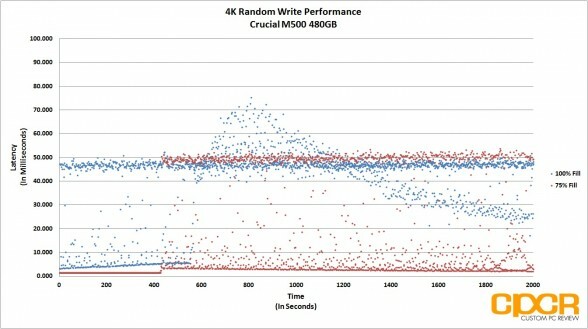 In fact, as illustrated in the PC Mark 7 and PC Mark 8 Expanded Storage Benchmark, the RevoDrive 350 performed similar to an enthusiast SSD such as OCZ’s own Vertex 460 when it comes to a typical consumer workload. 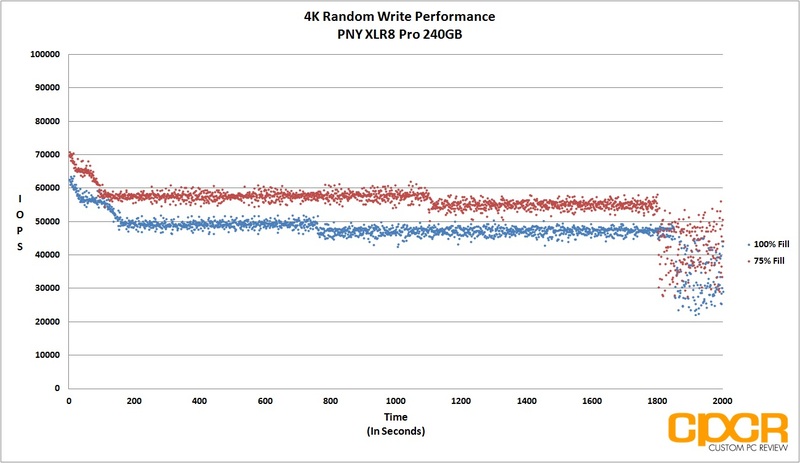 In order to really take advantage of the RevoDrive 350, you’d need to toss it into a server and crank up the I/O requests, or be one of the few people who do work on uncompressed 4K video streams, and need the bit of extra bandwidth the RevoDrive 350 can provide. 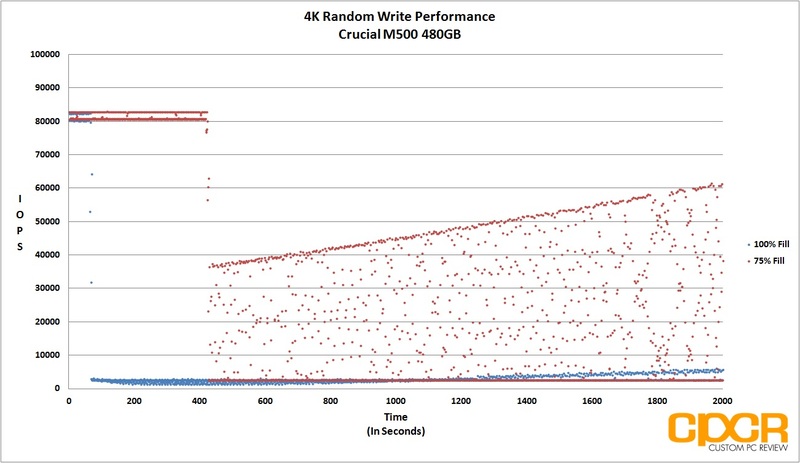 While OCZ has decided to go to market the RevoDrive 350 as a client oriented drive, its strengths obviously lie in the enterprise and I’m sure plenty of servers will be rocking the new drive as a cheap application accelerator or something of that nature. 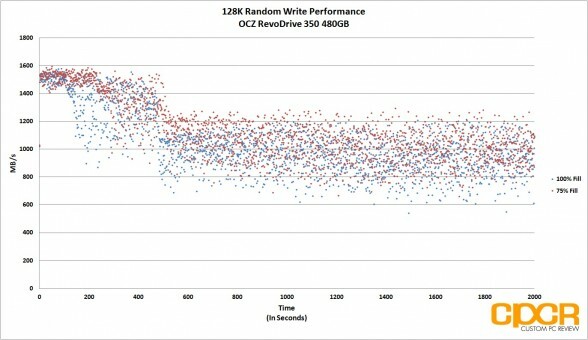 The OCZ RevoDrive 350 480GB can be found at various online e-tailers for around $829.99, which translates to ~$1.73/GB. While it’s ~2-3x more expensive than a typical SATA based client SSD, it’s not really an apples to apples comparison considering the RevoDrive 350 has four SSD controllers, 32 NAND packages, and an additional onboard storage controller to tie the whole package together. It’s simply more parts, more complexity, and in turn, more expensive. 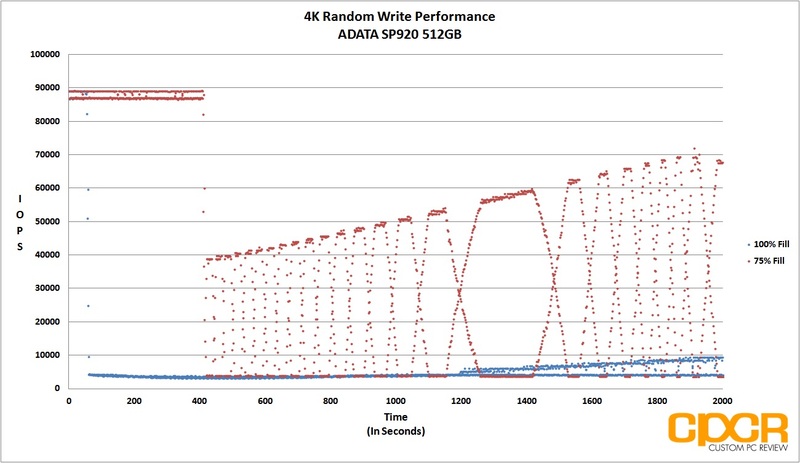 Luckily for those who need extra speed for large block transfers or high queue depth operations, there’s no PCIe solution out there that can deliver this level of performance at under $2/GB. It just doesn’t exist… yet. Warranty on the OCZ RevoDrive 350 is a standard 3 years, but you do get 50GB/day which is very respectable for a client drive. Personally I’d like to see a 5 year warranty on the RevoDrive 350, especially since OCZ’s client oriented Vector features a 5 year warranty, but given the fact that OCZ’s enterprise Z-Drive 4500 PCIe SSD also features a 5-year warranty, and they’re based on a similar design, it’d probably be a bad idea to cannibalize sales on your own high margin enterprise products. 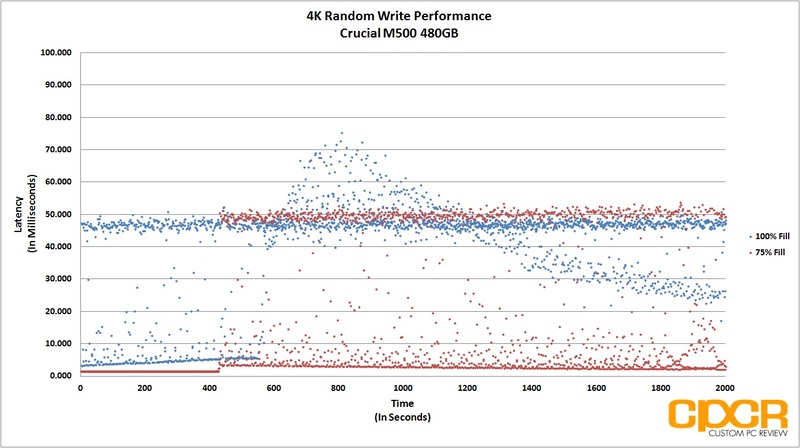 Overall, the OCZ RevoDrive 350 is an phenomenal, high performance PCIe SSD designed for users looking for RAID-0 like SSD performance without having to deal with the troubles of a RAID array. 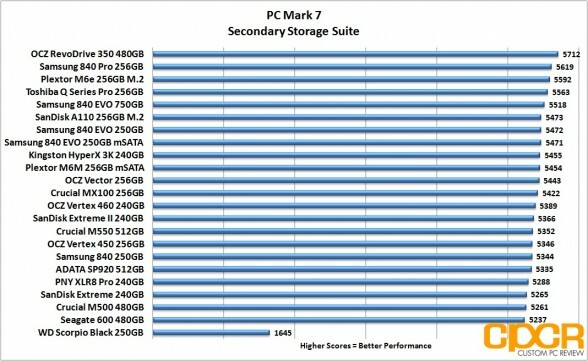 Those with appropriate workloads that can fully take advantage of the RevoDrive 350 will be nothing short of impressed with its performance.